The trend has been colder and that is the theme we stick with now. The Winter Weather Advisory in place has been expanded a little farther south, but I still think even more areas outside of those on the map will be impacted by additional snow and ice tonight. The Winter Storm Warning is for general areas north and west of I-81. The most important message I can post now is this: Roads will get more icy as it gets dark. Places on the edge of freezing will ice up between 4 and 6 PM. Then the freezing line should drop farther south this evening as shown in the temperature maps below. I think snow amounts may be close to doubled before more freezing rain. 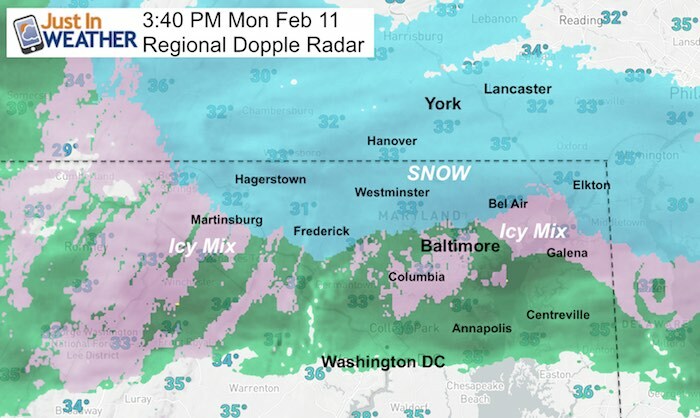 There will also be some snow and ice impacting south of this zone, which I will highlight in the radar simulations and temperature maps below. As for schools, I think the plan will repeat: If yours were closed today, there is a good chance they will be tomorrow. If they were delayed today, a good change they are delayed as well. 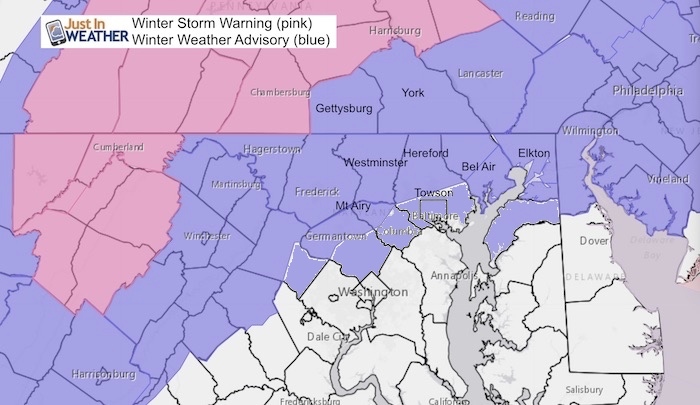 Expanded areas now include ALL of Harford,western Howard, and Montgomery, until 10 AM Tuesday morning. Newly Added: Southern Baltimore County, Baltimore City, eastern Howard, eastern Montgomery until 7 AM Tuesday morning. Kent County joins Cecil County on Delmarva AND extended until 6 PM Tuesday evening. Thank you for your patience as my web site has some issues in the past 24 hours. It should be able to handle to traffic spikes, but I am looking to improve the design and delivery to make reading my notes and maps much easier. The warming above freezing is on schedule. Snow remains paling on the north side, mixing with sleet at times between Finksburg and Towson to White Marsh. More sleet or rain south to BWI. Then all rain between Washington and Annapolis. It will turn colder over the next few hours. If you has snow or ice this morning, plan for possible wintry mix and some icing after 6 PM. If you just had rain or thawed roads this morning, then you will likely stay just wet. Ice and Freezing will develop and drop south. This will include the western side of Baltimore and may drop to northern Montgomery County. If your schools were closed this morning, a very good chance they are closed again. If they were delayed this morning, a very good chance they will be delayed again. Anne Arundel and metro Washington might be the difference and remain wet. Northern zones 2 to 4 inches. Where it has stayed snow, their full event total should be over 5 inches. Similar placement of 2 to 4 new inches. Where it has stayed snow, their full event total should be over 5 inches. Up to 1 in Baltimore. These places should turn back to ice before sunrise. Expect ice in the typical areas just north and west of I-95/Baltimore. Schools likely delayed or closed again. The ice line will slowly retreat to the north. These often do not behave as models suggest, so its possible to remain icy longer. Most of the region should be thawing, but some pockets of colder air may linger… including the Hereford Zone. I think this is holding up pretty well. The snow will be a minor impact on Monday morning. The transition zone will be between Washington and Baltimore. This region will be within one to two degrees of freezing. That will make or break if there is impact on the roads.